Are you a Bride-to-Be planning your special day! And you’re looking for high quality and personal service; you’ve come to the right place. At Glitz, Glamour n' Elegance we’ll give you the attention to detail and personal service you’ll come to expect and enjoy! We look forward to helping you with all your Floral, Event Planning & Accessory needs! And I’ll custom design your floral decor from bouquets & centerpieces to the boutonnieres, & corsages; all of your one of a kind accessories from the jewelry & veils to the hair pieces & toasting glass charms and so much more!. Each wedding I custom design for is special to me because I get to see the unforgettable look when a bride receives what she’s always dreamed of! Also don’t forget to ask about our wedding & event planning services. 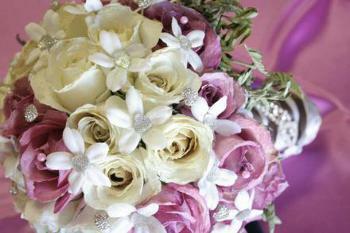 Why not add a touch of Glitz, Glamour n’ Elegance to your special day?